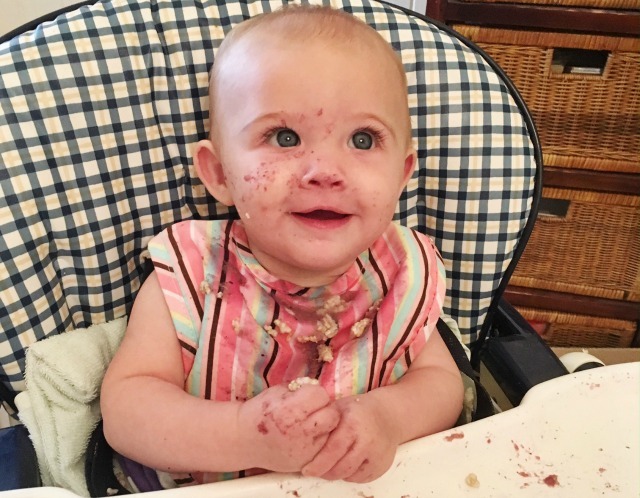 I remember when it came time to give Master E his first taste of solid food and embark on new baby food recipes, there seemed to be a lot of stigma around the correct age to commence solids. Babies usually commence solids between the ages of 4-6 months but we simply went on our instinct and on the fact that Master E was showing interest in our food when we were eating, that’s when we started at around 4 months. If you’re ever concerned about when to start your child on baby food, it’s always a good idea to ask your health practitioner. As we moved on through the stages, from purees to chewable food, baby food started to become a bit more fun. I’ll never forget the faces Master E would pull when experiencing the new textures of the baby recipes I’d created for him. Sometimes if he was struggling with the textures, particularly meat, I would blitz them into a puree to make it easier for him but so he could still experience the new taste. I was lucky to have a neighbour that had a daughter the exact same age. To change up the variety for our babies, we used to agree on the food we’d each make, portion it up and swap the food with each other so our babies had variety. A great way to do it if you have a friend with a similar aged child. But, there were times when I was utterly exhausted and the last thing I wanted to think about was preparing more food. You know, those nights when you just couldn’t be bothered cooking so you order takeaway or those times you need to go out but haven’t had time to prepare and pack a lunch for your bub? Well, that used to happen to me A LOT and I’m not afraid to say that I resorted to pre-packaged baby food. Boy did it take a lot of the stress off my shoulders, especially having post-natal depression. These homemade baby food recipes are great for when you do have the time to cook. There are some baby puree recipes great for the early stages right through to a couple of toddler food recipes. If you’re after thermomix baby food recipes, I’m quite certain you can prepare these baby recipes in a thermomix or a bellini intelli kitchenmaster; simply use these appliances instead of the saucepan and food processor. If you’re not keen on mucking around with saucepans and other equipment, check out these >>> baby steamer and blender combos, they make making baby food a whole lot easier. Peel and core the pears and roughly chop. Place in a saucepan with a tiny bit of water, cover and cook on a low heat for around 10 minutes or until it’s soft (you can easily pierce it with a knife). Puree the pears with a blender, stick mix, Thermomix or Bellini Intelli. Place the remainder in ice cube trays as this is fine to freeze. 200g root vegetables such as carrots, parsnips, swedes. Place the vegetables in a saucepan, cover with water and cover with a lid. Cook on low heat for about 15 minutes or until the vegetables are soft. Strain the water but keep a little bit of the cooking liquid. Use a blender, stick mix, Thermomix or Bellini Intelli to puree the vegetables while adding a tiny bit of the cooking water to make it the right consistency. Set aside to cool and place the remaining puree in ice cube trays or small containers to freeze. Run out of time to make this Root Vegetable Puree? Try the Heinz Organic Sweet Baby Vegetables. In a saucepan, melt the butter and then fry the onion until it becomes translucent. Add all other ingredients (not the chicken) and let it simmer for 20 minutes. Add the chicken to the saucepan and cook for another 5-10 minutes or until the pumpkin is soft. Puree to the consistency you prefer. Divide into individual ice cube trays or containers and freeze. Run out of time to make this Chicken, Apple & Pumpkin Puree? Why not try the Heinz Golden Sweet Corn & Chicken puree. Place all of these cooked ingredients in a blender or food processor and puree until it comes to a creamy consistency. Add onion, carrot and celery and sauté for 5 minutes. Bring to the boil and then lower the heat and simmer for 20 minutes. Add the pumpkin and simmer or a further 30 minutes until the pumpkin is very soft. Puree to the desired consistency and divide into portions. Run out of time to make this Braised Lentils and Pumpkin Puree? Why not try the Heinz Pumpkin, Veg and Couscous! This was one of the baby recipes that my mother in law passed on to me although I’ve removed the sugar element from it. Preheat oven to 180 degrees Celsius. Line a slice tray with baking paper and set aside. Drop the oven temperature to 150 degrees Celsius and bake further for one hour. Ensure you wash your leeks very well as they are prone to hidden dirt. Slice it lengthways into a half and then slice each half finely into half circles. Heat the oil and the butter in the saucepan over a medium heat. Add the onion and the leek, cook, stirring for around 5 minutes or until translucent and soft. Add the garlic and sauté for one minute. Add the potatoes and zucchini, stir to coat. Lower the heat and simmer 10-15 minutes until the potatoes are soft. Remove from the heat and blend with a blender, Bellini Intelli or another food processor until it’s smooth. If it is too thick, simply add some water. Add the cream and parsley and stir. Divide into ice cube trays or small containers and freeze. This was one of Master E’s favourite baby foods! Add all the ingredients to a saucepan and warm gently on low heat, stirring frequently. Remove the warmed pudding and put it into a food processor, blender, Thermomix or Bellini and blend to the consistency you require. If you have an older baby that is OK with texture, you don’t have to blend. Mini Savoury Muffins – Finger Food For Babies! A perfect baby finger food recipe and a great toddler food too! Optional: diced ham and herbs to taste. Sift the flour and baking powder into a bowl and combine. Stir through the vegetables and the cheese. Combine the oil and the milk and then add a cracked egg. Whisk it together. Make a well in the centre of the flour mix and pour in the oil, milk and egg mix. Mix until it’s just combined. It should be a thick batter. Spoon the mix into the muffin tray. Bake for about 15-20 minutes or until the muffins are lovely and golden. Cool in the tray once removed and then turn out on a cooling rack. Serve and freeze the others for later. Heat oil in the saucepan. Add the spring onion and stir for 30 seconds. Add all the other ingredients and cook, covered, for about 3 minutes. Make sure you stir it a couple of times so it doesn’t stick. Looking for even more variety? Check out the prices and reviews of some great baby food cookbooks >> HERE. Love the idea of swapping baby food with a friend! We always had sachets of purées on hand for our kids – brilliant to keep in handbag / nappy bag for when you’re out longer than planned. How amazing you had a neighbour to play swaps with!. I’m about to go on the food journey with baby no 3 so I appreciate these suggestions.. The packet stuff is always handy for days out and when you need a meal off!